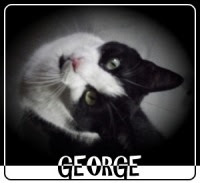 It's time for the April Gifted Gorgeousness update. This stitch-along, hosted by Jo of Serendipitous Stitching, features projects that in some way have been gifted -or- are being stitched to be given as gifts. During the first 3 weeks of March, I put stitches into my "Carousel Tiger" every day. I am so close to a finish, I think I will keep going. The "Carousel Tiger" was gifted to me along with "Carousel Zebra" and "Carousel Lion" by my sister way back in the 90's. I have since finished the other 2 kits. 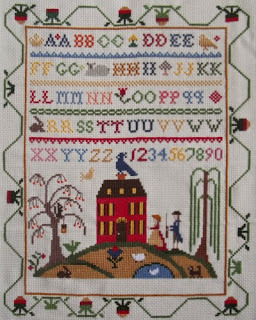 I have also kept up with my stitching on "Linen & Threads 2019 Mystery Sampler". I am just past half-way finished on April's swans, so I am right on track. 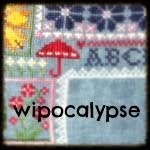 This year long project was gifted by the folks at Linen & Threads - feel free to join in at any time, if you so desire. 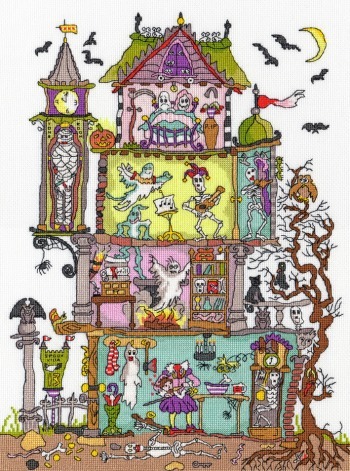 I managed progress on my "Bothy Threads Cut Thru' Haunted House", which was gifted by my sweetie this year. 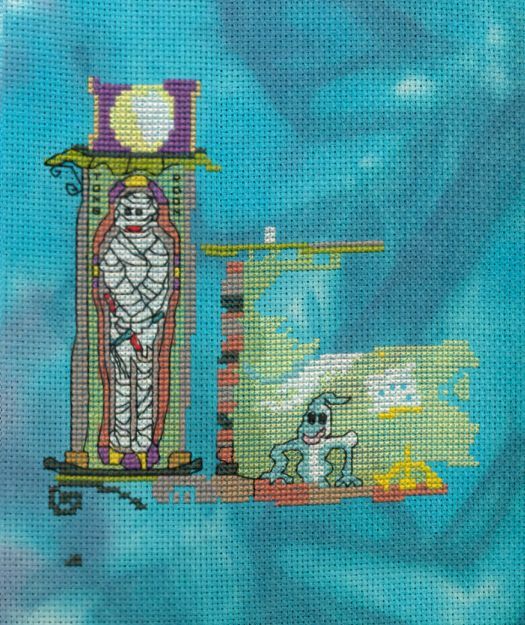 I finished back stitching the mummy and added a bit more stitching here and there. I also stitched on "Hummingbird and Fuchsias", which is a printed kit gifted by my Mom. I think I made a good bit of progress on this one. 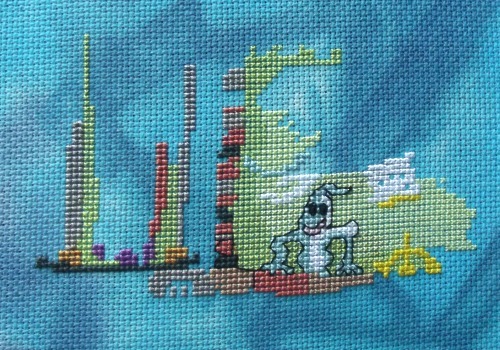 I ran short of stitching time the past couple of weeks, but I hope to do better this month. That's all for my update. It's time for the March Gifted Gorgeousness update. 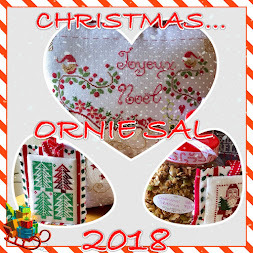 This stitch-along, hosted by Jo of Serendipitous Stitching, features projects that in some way have been gifted -or- are being stitched to be given as gifts. 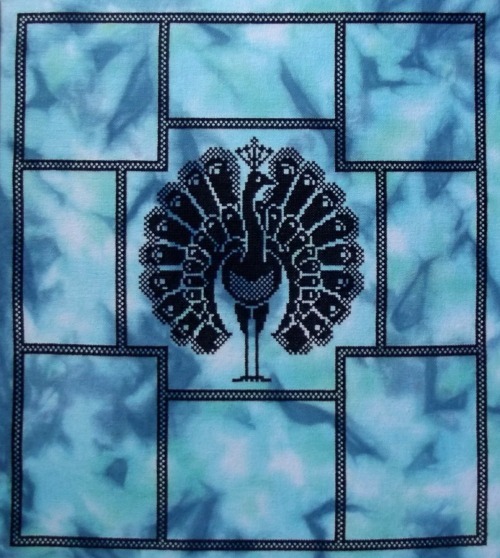 I stitched on several of my gifted projects this month. 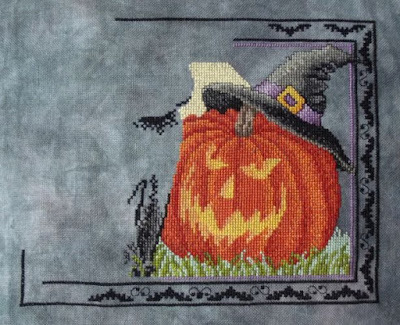 Shown above is "Halloween Pumpkin" by Sharon Pope. This chart is from the 2012 Just Cross Stitch Halloween Issue (Magazine gifted to me in 2012 by my sweetie). I managed to finish stitching the hat, did some back stitching, and worked a bit more on the border. 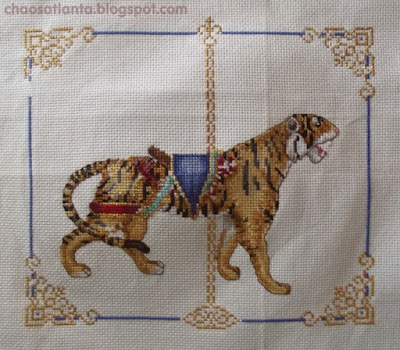 I have been doing the March challenge "one stitch (or more) per day" in the WIPocalypse group, and have made great progress on my "Carousel Tiger" (kit gifted to me many years ago by my sister). 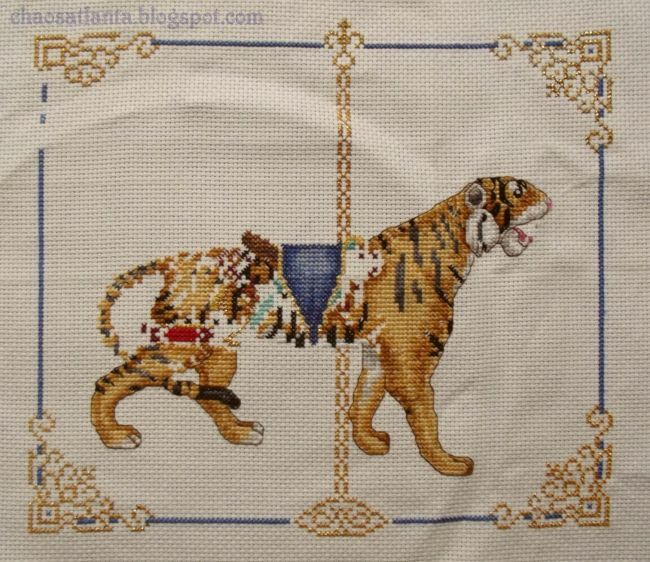 I have nearly completed the gold stitching & border, and put quite a few stitches into the tiger. The photo below shows where I started on March 1st. 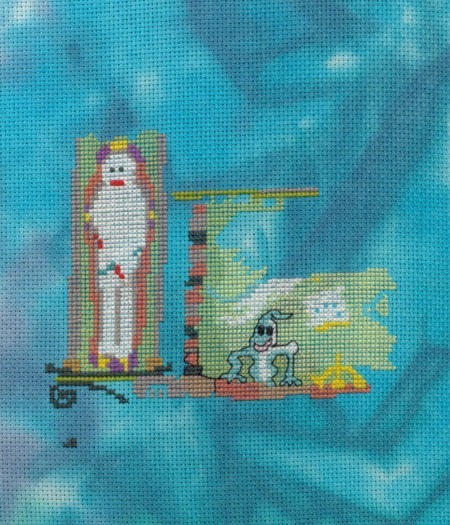 I also did a fair amount of stitching on my Bothy Threads "Haunted House" (kit gifted on Valentine's Day by my sweetie). I am loving this kit! That is my progress on gifted projects for the month. 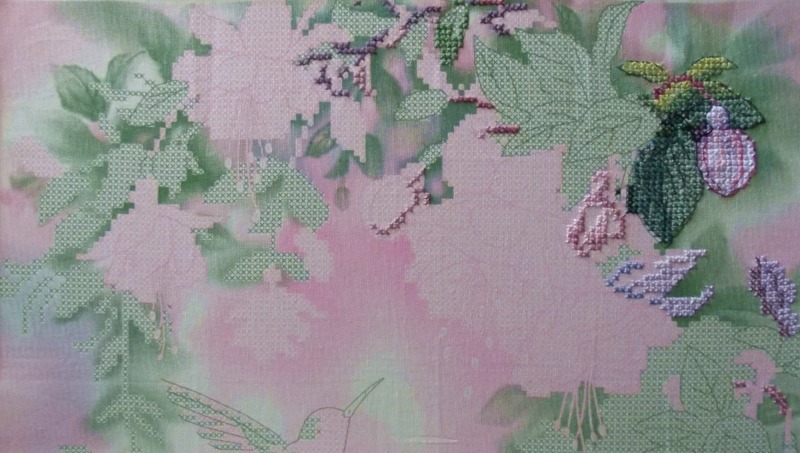 I hope to continue making good progress and maybe have a finish soon (No finishes yet for 2019). It's time for another Gifted Gorgeousness update. 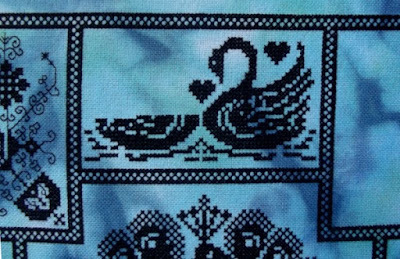 This stitch-along, hosted by Jo of Serendipitous Stitching, features projects that in some way have been gifted -or- are being stitched to be given as gifts. I have so many gifted projects that I'm sure to be participating in this stitch along for many years to come. Since I stitched the head on my "Berry Patch Rooster" for my last update, I decided to stitch the head on my "Carousel Tiger" for this update (shown above). 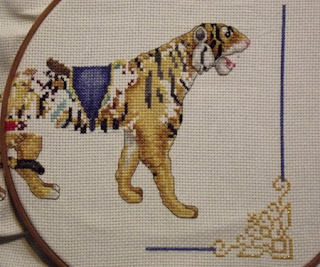 Whenever I work on this project, I remember why it is taking me soooo long to finish it. 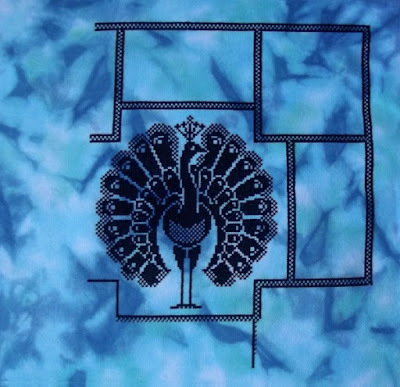 1) hard to read chart, 2) many color changes, 3) blended colors and use of blending filament, and 4) lots of fractional stitching on Aida. I have finished the other 2 carousel animals (lion and zebra), so I am anxious to finish this one, too! I worked on the Linen and Threads 2019 Mystery Sampler this month. I am about 1/2 way through February in the stitch along, so right on track. 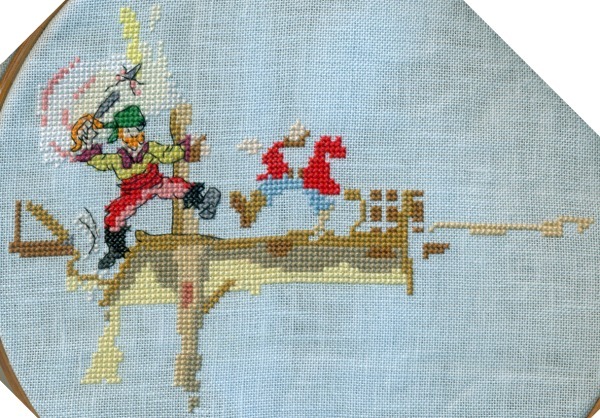 I also stitched a bit on my "Bothy Threads Cut Thru' Pirate Ship". 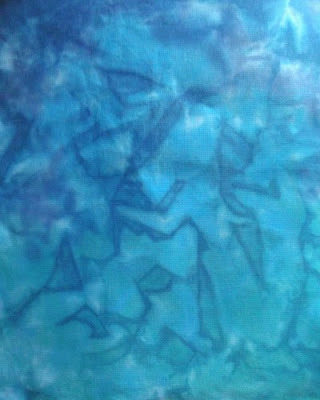 This was a Christmas gift, which I started on Christmas day. Now .... I have another new start (what?!?) that I received as a Valentine's gift from my sweetie. This kit has been on my wish list for a couple of years & happened to go on sale last month. So ... I am now also stitching "Bothy Threads Cut Thru' Haunted House". 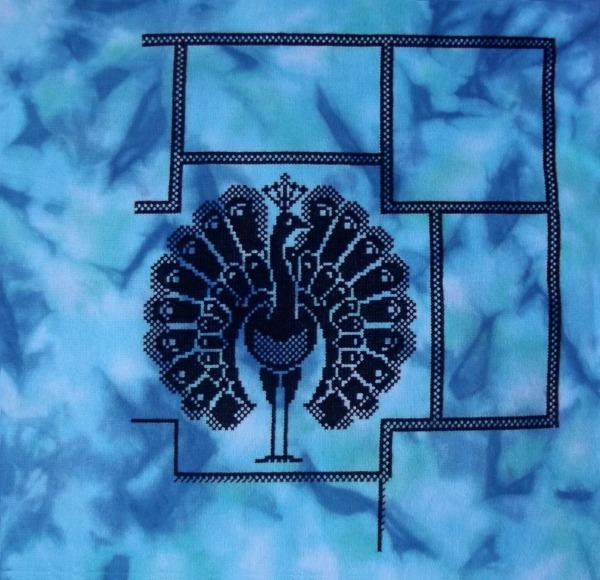 I had some dye left over from last time, so I took the light blue 16 ct Zweigart Aida from the kit and put my own spin on it. 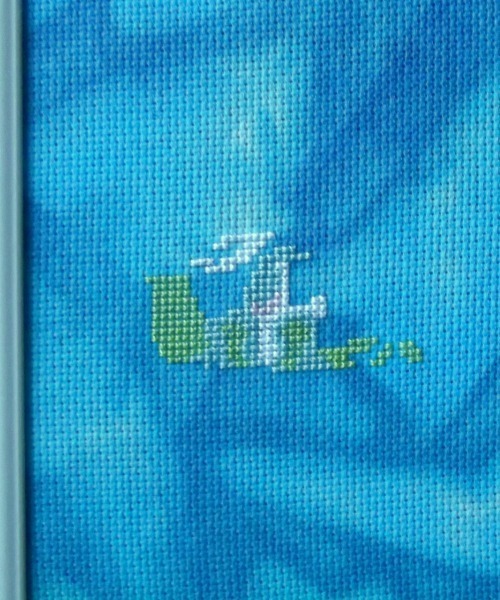 I have only stitched a small area so far, but I know I will really enjoy stitching this one. 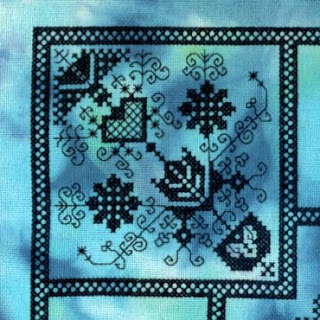 Would anyone like to stitch along with me on "Bothy Threads Cut Thru'" projects? 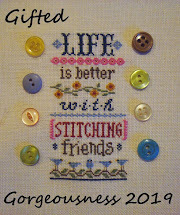 I remember that Debbie (http://debbiescrossstitch.blogspot.com/) was hosting a group for this & I really would like to stitch along with someone. Any takers? That's all I have for this update.